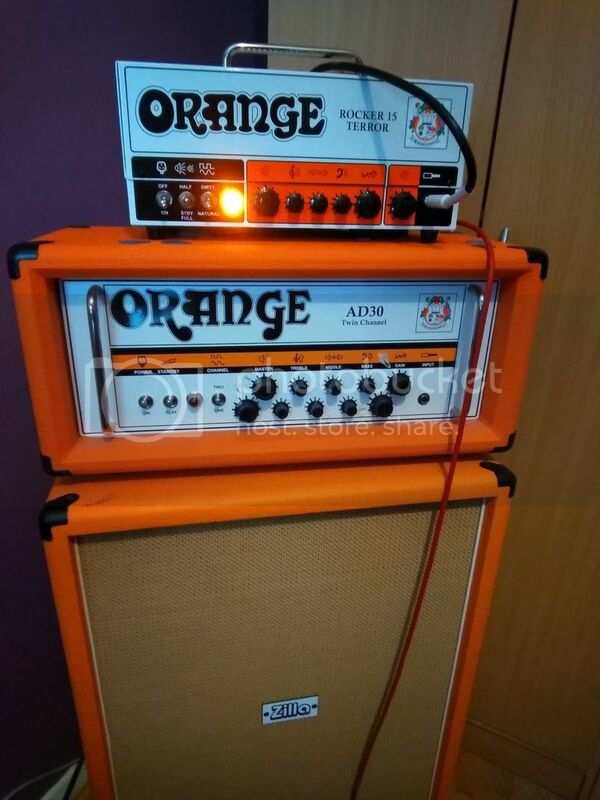 I need a second Orange amp. Currently I play on MK1 RV50, although it is by all means great piece of gear, it is also way too loud for 95% of gigs. And it's damn heavy to haul around. So, what I'm looking is lunchbox-sized, all-valve, gig-ready amp. Probably second hand, because I can't spend tons of cash right now. I've narrowed down my choice to Tiny Terror Vs Dark Terror. For most of the time I play mid-to-high gainy stuff (think 70s/80s hard-to-heavy), I don't necessarilly need sparkly cleans but it would be nice to have some edge-of-breakup tones. The only thing that stops me from choosing Tiny Terror right away is lack of fx loop since I like to throw some delay here and there. So, how does the DT cleans up with volume knob, are there any cleans with gain knob around 1:00? Is it only metal machine, or are there any other tones? Is TT clean-capable in band situations? How do they take pedals? I welcome any suggestions from you guys! From the 2 you've narrowed down, the question if you use the FX Loop or not, Dark Terror has it the Tiny Terror doesn't. Also since the Tiny Terror is no longer a production amp you'd be buying a used one and would not have manufacturers warranty where the Dark Terror which is still in production you can purchase new and have protection for it. 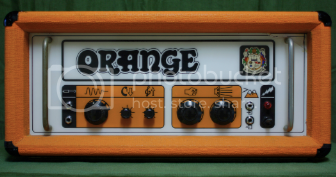 As far as the Dark Terror, its not a metal machine only, it can do anything you set it up to do when you play around with the shape knob and learn the right spots, as far as using FX, it takes any pedal in front and thru Loop with smooth rich tone. For going clean, how I do it, leave the Gain at 12 noon, switch off any overdrive, roll back your guitar's volume to a little lower than middle, use a compressor and an EQ with it set to the "V" shape which pulls some of the mids out makes my guitar tone sound a bit like an acoustic/electric. A little tap dancing you'll need to get used to if needing to swap between crunch and clean in a live setting. But if you want really clean from the DT, set the Gain to around 9 o'clock no higher than 10 o'clock it sounds fairly clean, at least for me. The same goes for my other ones as well so you'll not go wrong with any of them. Post back which you decide on and your thoughts on it. Good Luck, Happy New Year! The Rocker 15 Terror is your best choice here.... But they will cost more than a TT. The R15 terror has much better cleans than TT and is much more versatile and has fx loop if you need it. It has similar dirty tones to the TT but also the power scaling bedroom to headroom setting so again making it more versatile. I used a TT as a band practice amp and did a few gigs for years but when I got the R15 was really impressed with how much the humble lunch box amp had come on. Both can handle smaller gigs with a good cab. Both take pedals well when set clean... It's difficult to say if you can get a compromise you'll be happy with between the amount of delay you like and the amount of gain you like to use if you decide on the TT, personally I never use the fx loop and can still a good sound between the classic rock gain levels I like and a little bit of delay or reverb. Post back which you decide on and your thoughts on it. I've picked a Tiny Terror from a trusted seller for ~200 GBP. Came with bag, cables, and previously tested JJ tubes in damn good shape. First impression: A-W-E-S-O-M-E. I played 7w mode, volume around 12:00, tone at 1:00, gain 2:00. Maxon OD-9 (always on) in front (level 2:00, drive dimmed, tone 12:00). I really can't believe how great it cleans on a fender strat, I could achieve literally everything with my volume knob - fair cleans, classic crunch that we all love and nice, saturated quite heavy distortion. It is loud, even in 7w, but thanks to low wattage I can finally hear tubes giving their best. Man, I'm so happy not only because its tone, but also and finally my aching back felt relief. Last edited by mici88 on Fri Jan 18, 2019 6:42 am, edited 1 time in total. I can't see the picture!!!! Still, happy to see you found something great!!!! 15w is often too much. My AD15 is more than enough 95% of the time (I don't gig a lot), but it's nice to have options at hand from 15 to 50w. Nice score. The TT is a nice sounding amp. I’d recommend checking out 15W mode. I personally think it sound better than 7W mode, even at the same volume. Enjoy! It sound like you got a great amp at a great price. I heard that some folks put 12au7 preamp tubes in it to clean it up and use TT as a pedal platform. Did any one try it here? How were the results? You would lower the gain a little... in exactly the same way you would by turning the gain knob down a little. It may change the tone a little too. You may like it. I have and play a Dark Terror. What was posted above about turning the gain down down does work to “clean” up your tone. I use a Les Paul and learned to get a decent “clean” tone by rolling the DT gain back to 10:30 to 11:00am. Then I roll guitar volumes back a bit more and turn the amp volume up some until I reach a spot where “clean” to gain tones are all found between say, 6 and 10 on my Les Paul's volume knobs. It seems I have found a sweet spot today for great clean and wonderful crunch tone, because that's all I need right now for current band. Sounds heavenly on strat. With volume knob I can go from mentioned clean to crunch.